The rough and winding road between Tupiza and Uyuni. Bolivia. Baron terrain and quite dry between Tupiza and Uyuni. Through the mountains to Uyuni from Tupiza by jeep. 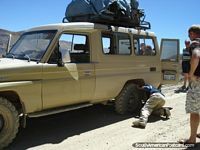 The 1st of 2 flat tyres on route across rugged terrain from Tupiza to Uyuni in a jeep. 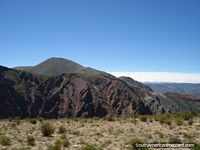 Andes terrain, houses and hills in Atocha. Houses up on the dry hills of Atocha.